In this post: airfare search tips; low-cost or budget airlines; regional as alternatives to traditional carriers. How to find the best plane ticket? Unless you travel on a company dime, it could become a daunting task. Balancing budget, convenience and timing combined with tricky geography requires a lot of patience and good will. Travel planning makes your head spin? Here are tried and true travel planning resources we’ve been using while slow traveling the world. Eventually, every more or less frequent traveler develops a technique of dealing with these pesky bookings. From oh so 20th century tradition of employing travel agents to a tricky combination of online aggregators paired with VPN-conjured exotic locations, there should be a sure way of snatching that coveted ticket. Budget and regional airlines make their mark too. My routine begins with a couple of aggregators. They vary depending on our next destination. My current favorites are Momondo and Matrix Airfare Search. From there, I switch to 3-4 top results. I always book tickets directly from an airline. Statistically, problems with bookings do happen and dealing directly with the airline helps to solve them quicker and with fewer hassles. This process works reasonably well. However, there is a way to improve it. It’s not a big secret that some regional and budget airlines do not appear in search results. Momondo is doing a better job than other aggregators, but still their listing is not complete. There used to be some budget flight search engines or directories, like wheretowhen.com, but they slowly disappeared, got acquired and/or switched to conventional searches. Traveling in a certain geographical region helps to discover local airlines. An advertisement in a local newspaper, a name on a departure board, a conversation with a neighbor leads to a new find. Some low-cost airlines are tiny, just a one- or two- men operations. Others happened to grow into successful enterprises. 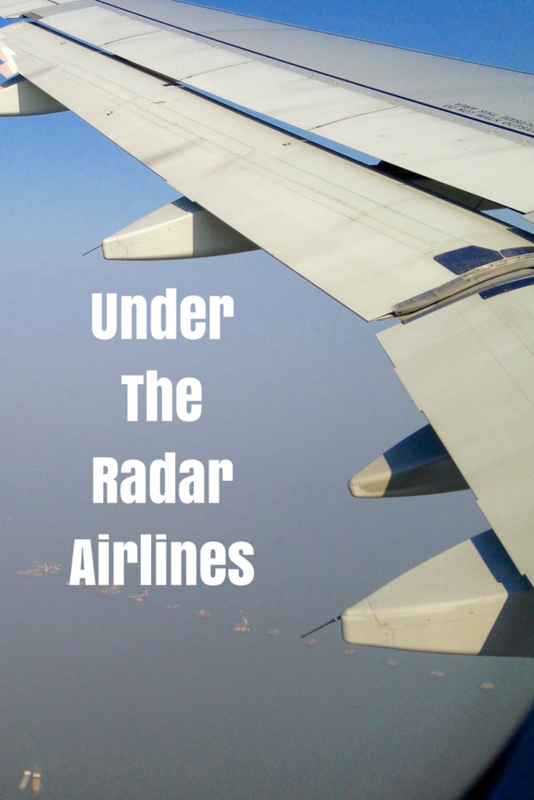 I started compiling this list of lesser known budget airlines years ago. Eventually, some of them ended up on Momondo and became, more or less, household names. The list is in alphabetical order. Some budget airlines expand/shrink or change the geography of their operations and it is too time-consuming to keep up with them. Aigle Azur – legally Société Aigle Azur Transports Aériens is an airline with its head office in Tremblay-en-France, France, near Paris. It operates domestic scheduled passenger services and international services to Algeria, Mali, Portugal, Russia and Tunisia. Air Arabia – is a low-cost airline with its head office in the Sharjah Freight Center, Sharjah International Airport, in Sharjah, United Arab Emirates. Air Arabia Maroc – a Moroccan low-cost airline, set up as a joint venture between various Moroccan investors and Air Arabia. AirAsia – the world’s best low-cost airline. It offers the cheapest flights to over 100 destinations across Asia and Australia. airBaltic – is the Latvian flag carrier airline and a low-cost carrier. Air Do – previously known as Hokkaido International Airlines, is a Japanese low-cost airline operating scheduled service between Tokyo and cities in Hokkaidō. Air Europa – Air Europa Líneas Aéreas, S.A.U. is an airline in Spain, the third largest after Iberia and Vueling. Air Nostrum – Air Nostrum, Líneas Aéreas del Mediterráneo, S.A., aka Iberia Regional, is a regional airline based in Valencia, Spain. Air Nostrum is an independent carrier which operates as a franchisee of Iberia Airlines and Binter Canarias. Air Transat – is a Canadian airline based in Montreal, Quebec, operating scheduled and charter flights, serving 60 destinations in 25 countries. Arkia – Arkia Israeli Airlines Ltd, commonly referred to as Arkia, is an Israeli airline. Astra Airlines – is an airline based in Thessaloniki, Greece. Serving 22 destinations in Greece and seasonal flights to Tel Aviv. Atlantic Airways – is the national airline of the Faroe Islands, operating domestic helicopter services and international passenger services as well as search and rescue responsibilities from its base at Vágar Airport, on the Faroese island of Vágar. Binter Canarias – is an airline based in Telde, Gran Canaria, Spain. It is a regional air carrier operating inter-island services within the Canary Islands, in addition to services to Morocco, and Portugal. Blue Air – legally Blue Air – Airline Management Solutions S.R.L, is a Romanian low-cost airline headquartered in Bucharest with its main base at Henri Coanda International Airport. Borajet – is an airline based in Yeşilköy, Bakırköy, Istanbul, Turkey. It is a privately owned regional airline operating domestic services. It suspended operations on 24 April 2017 and plans to resume them sometime in 2018. Cobalt Air – a Cypriot airline based at Larnaca International Airport in Larnaca, Cyprus. Cebu Pacific – the Philippines’ largest airline; 30 international destinations and 34 domestic destinations. Corendon Airlines – is a Turkish-registered airline headquartered in Antalya, Turkey. Chalair Aviation – established in 1986, Chalair Aviation has developed a network of domestic regular lines in France. Chalair’s strength is its expertise in providing a “tailor-made” service. Eastar Jet – is a low-cost South Korean airline established in 2007. Eastar Jet chose a single aircraft type fleet (a new generation Boeing 737-600/700) which allows for greater efficiency in maintenance and support of the low-cost structure. EVA Air – is a Taiwanese international airline based at Taoyuan International Airport near Taipei, Taiwan, flying to over 40 international destinations in Asia, Australia, Europe, and North America. FastJet – is a low-cost African airline. The airline was initially created with the acquisition of Fly540, an airline operating in East Africa, and flights in Fastjet’s own name commenced in November 2012. IndiGo – is an Indian budget airline company headquartered at Gurgaon, India. It is the fastest growing and also the largest airline in India with a market share of 38.9% as of May 2015. Jet2.com – is a British low-cost airline in the United Kingdom. It operates services from eight bases, seven in the UK and one in Spain, to 58 destinations. The airline also offers contract charter and air cargo services. Luxair – legally Luxair S.A., Société Luxembourgeoise de Navigation Aérienne, is the flag carrier airline of Luxembourg with its headquarters and homebase at Luxembourg Findel Airport in Sandweiler. Malindo Air – is an airline based in Malaysia established in 2013. It is a joint venture between National Aerospace and Defence Industries of Malaysia and Lion Air of Indonesia. The name Malindo is derived from the names of respective countries: Malaysia and Indonesia. Current routes include popular destinations in SE Asia and Australia. Middle East Airlines – Air Liban S.A.L., more commonly known as Middle East Airlines (MEA), is the national flag-carrier airline of Lebanon. It operates scheduled international flights to Asia, Europe, the Middle East and Africa. MEA is a member of the SkyTeam airline alliance, the Arab Air Carriers Organization (AACO), and the International Air Transport Association (IATA). Norwegian – Norwegian Air Shuttle ASA, trading as Norwegian, is the third largest low-cost carrier in Europe, the second-largest airline in Scandinavia, and the ninth-largest airline in Europe in terms of passenger numbers. Peach – is a low-cost airline based in Japan. Its head office is on the fifth floor of Kensetsu-to on the property of Kansai International Airport in Izumisano, Osaka Prefecture. Pegasus Airlines – is a low-cost airline headquartered in the Kurtköy area of Pendik, Istanbul, Turkey. Low cost flights to top Turkey and European Cities. Primera Air – is a Danish leisure airline which was founded in 2003 as JetX. Primera Air Scandinavia has its headquarters in Copenhagen, Denmark. SATA – legally SATA Internacional – Sociedade Açoriana de Transportes Aéreos, is an airline based in São Sebastião, Ponta Delgada, in the Azores, Portugal. It is a subsidiary of SATA Air Açores. Scoot – is a Singaporean long-haul budget airline owned by Singapore Airlines. It launched flights in 2012 on medium and long-haul routes from Singapore, predominantly to Australia and China. Skymark Airlines – is a low-cost airline headquartered at Haneda Airport in Ōta, Tokyo, Japan, operating scheduled passenger services within Japan. Sky Express – legal name Cretan Aeronautical Exploitations, is a Greek airline headquartered in Heraklion International Airport. It was established in 2005 and operates a number of domestic flights, serving 18 destinations. Small Planet Airlines – is a European leisure carrier who at this time is operating in 4 main markets: Lithuania, Poland, UK and France. Spirit Airlines – is an American budget airline headquartered in Miramar, Florida. Spirit operates scheduled flights throughout the U.S. as well as the Caribbean, Mexico, and Latin America. Tassili Airlines – is a passenger airline based in Algiers, Algeria. It provides scheduled services out of Houari Boumedienne Airport, as well as charter flights on behalf of the Algerian oil industry. Tigerair – merged with Scoot on 25 July 2017, operating under the Scoot brand. Tigerair Taiwan – a low-cost carrier (LCC) based at Taoyuan International Airport; flies to 16 destinations in China, Japan, South Korea, Taiwan and Thailand. Transavia – is a Dutch budget airline that offers charter flights and scheduled flights to summer and winter holiday destinations around Europe and to the Mediterranean. TUI fly (formerly Jetairfly) – is a Belgian airline with its registered office at Brussels Airport. The airline is a subsidiary of the TUI Group and part of the TUI Airlines. Vanilla Air – is a budget airline in Japan wholly owned by All Nippon Airways. Its head office is within Terminal 2 of Narita International Airport in Narita, Chiba Prefecture. VivaAerobus – Aeroenlaces Nacionales, S.A. de C.V., trading as VivaAerobus.com, is a Mexican budget airline part-owned by the founders of Europe’s biggest low-cost carrier, Ryanair and the biggest bus company group in Mexico, IAMSA. WestJet – is a Canadian carrier that provides scheduled and charter air service to 90 destinations in Canada, the United States, Europe, Mexico, Central America and the Caribbean. Wizz Air – Wizz Air Hungary Ltd., is a Hungarian airline that often uses secondary airports serving many cities across Europe, Israel and the United Arab Emirates. WOW air – is an Icelandic budget airline founded in 2011. In its own words: WOW air is a happy, low-fare, long-haul airline. Great list but in Europe, Ryanair is as big, if not bigger than easyJet. Your should check them out as they serve many destinations across Europe. Thank you, David :). Ryanair is not on the list exactly for this reason. It is one of the major players in Europe now, so it does not fit into “lesser known” category anymore. Good stuff Elena! We have only flown Air Asia like 80 times LOL. Thank you, Ryan. It’s funny, right? Originally, Air Asia was not listed since I thought that everybody knows about it. However, I was surprised that it is relatively unknown outside of the region (i.e. newcomers to Asia might never heard about it before). That’s the reason it’s been added here. Great list, definitely saving this for later. You might check out Vueling (Spain) and WizzAir (Hungary) which offer low cost European flights. I’ve flown with both (Vueling Edinburgh – Rome and WizzAir Glasgow-Vilnius) and got great deals on both! Thank you, Tracy. Great suggestions! Added both to the list. I used Vueling a lot when I lived in Spain. Since it’s so popular there, I wrongly assumed that everybody knows about it that is not the case outside of the country. Wow, Elena! This is quite an extensive list along with a nice lead-in. I agree with you about going directly through the airlines. Been burned the couple of times my wife and I didn’t do that. I used to get lots of emails from Peach with ridiculously cheap deals but for specific days throughout the year. I’d recommend getting on their mailing list if you’re into that. If possible, I’d like to nominate a couple to your list. Air Asia is a pretty awesome budget airline in Asia and one that we always went with first when traveling through Asia. More specific ones include Malindo in Malaysia and Eastar Jet in Korea that were both pretty reasonably priced and got the job done with pretty nice service. If I ever travel to Europe, I’ll definitely come back and refer to your list because this is really thorough! Thanks for sharing, Elena. Hi, Duke great to hear from you :). Thank you for your suggestions. They would be excellent additions to the list. Updating now. Cheers! Great list. I have bookmarked this for future reference. Thank you. This is so helpful! I will definitely refer to this in the future for finding a cheap flight! Thank you for putting this together. Wow! This is such a great list of budget airlines! I will definitely check out Momondo in the future! Great list! Will come in handy next time I’ll book a trip. I’ve only heard about the budget airlines around Europe and part of Asia where I’ve traveled before. Hi Mia, thanks for stopping by. I am glad that you find this list useful. Happy travels! I have only heard of a few of these … as a Canadian, Westjet is a favorite of mine, as their air crew is one of the friendliest in the business! Good to hear a positive opinion about an airline :). I know now what I’ll be flying when next time in Canada. Cheers.